Discussions with Gary and Tina: Listen in while Gary and Tina discuss and expand on EFT's many tools and concepts. Demonstrations by Tina: These include basic demos to aid the newcomer as well as demos using more sophisticated approaches. 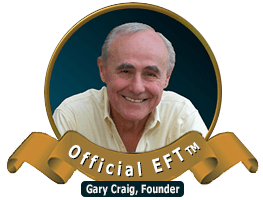 Top Level Sessions with Gary: 11 full length sessions that blend all the EFT tools and concepts together. For your convenience, they are broken up into approx. 15 to 25 minute segments and contain (1) alerts to let you know when various tools & concepts are being used and (2) studio comments by Gary to emphasize useful points. Pamela - 5 Parts: Hepatitis C and Severe Vaginal Issues. 11 full length sessions (approx. 30 to 60 minutes each) with Gary that are specially designed for tap along, do-it-yourself benefits. They also demonstrate the Art of Delivery. See the Borrowing Benefits Instructions at the bottom of this page for a description and instructions. Lavern: Rejection--"I don't want to dance." Andy: "I could never do anything right." Patricia: Social discomfort & "Momma didn't want me." Sarah: Alcoholic Mother & "I must fix the world." 2 sessions with Gary that introduce the next level of EFT ... getting results by tapping FOR the clients rather than ON them. session than years of conventional therapy. And it can all be done in your living room and at your own pace. It's not perfect. We don't get 100%. But neither does conventional therapy. I've led audiences of several hundred people through this process and, invariably, about 85% report positive results. Further, upon discussions with the remaining 15%, I learned that most of them didn't follow the instructions properly. The bottom line here is that impressive benefits are available to anyone willing to learn the process. In essence, it involves tapping along with someone else's issue while watching an EFT session (either live or on video) and thus "Borrowing Benefits" for yourself. It makes perfect sense because the issues being addressed for someone else on stage tend to parallel yours. You may not have the precise fears, guilt, traumas, resentments, etc. as the person on stage but you DO have your versions of them. Thus, while the on stage tapping may not aim at the exact center of your issue, it DOES land on the target and is usually close enough to the center to be of major value. Let's look at this from another angle. Suppose, for example, the on stage client is a male war veteran dealing with his intense traumas. In this case, you might erroneously conclude that Borrowing Benefits from his session wouldn't work for you because his war issues have seemingly nothing to do with your issues as a housewife, architect or musician. Whatever your station in life, you have collected a lifetime of fears, guilt, resentments, traumas and the like that parallel those of the war veteran. Everyone does this. The details may be different but the essence of these emotional issues is the same. Borrowing Benefits works nicely on this essence and that's why it often produces surprisingly deep rewards. I have included 11 videos within our Art of Delivery videos that are specially designed for the Borrowing Benefits process. These latter videos instruct you when to tap along and when to pause the video so you can assess and guide your own results. Here's a brief video giving you two examples from our Borrowing Benefits videos. The first one features Tam and his difficulty with a past memory while the second one features a delightful couple, Roger & Mary, undergoing an EFT couples counseling session. These videos have proven to be highly effective and, in the eyes of many, they are more entertaining than any reality TV show. Further, each one can be used repeatedly for thousands of issues. I know of no limit to their usefulness. Caveat: While EFT and Borrowing Benefits are widely used as self-help tools about 3 or 4% of the population (my estimate) are frail enough emotionally and physically that they shouldn't attempt ANY form of healing without the presence and/or guidance of a qualified health professional. Option 1. The lazy but reasonably effective way. If you don't want to study and learn the in-depth use of the Borrowing Benefits process given in #2 below, you can simply tap along with the videos as though you were the on-stage client. No need to follow the detailed instructions or to memorize anything, make lists or exercise diligence of any kind. Just tap along with the on-stage clients. Easy. Enjoy the intriguing videos and allow my experienced delivery of EFT to reach into your own issues. You should, however, at least be familiar with the tapping points as given in our Basic Recipe article. If you choose this method, however, your results are not likely to be dramatic in the short run because you are not aiming EFT at anything specific. But, if you perform this process consistently (at least 3 times per week), the process will tend to work on your specifics in the background and your improvements should gradually show up as the weeks unfold. The more you do it, the better your results. After 3 or 4 weeks, you may notice that your headaches, backaches and other bodily symptoms subtly decline or disappear. Your relationships may become easier. You may lose weight, make better decisions and things that used to annoy you may cease to be bothersome. In short, a subtle but powerful form of peace will likely substitute for many of your negative emotions so that a new level of calm and freedom from pain can be yours. Many people start of with this option and then graduate to Option 2 below. Option 2. The dedicated way that can get right to the roots. Start by listing 5 bothersome memories (we call them Specific Events). Typically they would be about 5 seconds to 3 minutes long but they must be short enough to have only 1 emotional crescendo within each one. You may not collapse them all in one session. If not, then save the unresolved (or partically resolved) ones for another time. Make a mental movie of each Specific Event and give it a brief title. Estimate the crescendo’s intensity on a 0-10 scale as that intensity shows up NOW (not when the event originally happened). For this purpose, 10 is as intense as it has ever been and 0 is no intensity whatsoever. Write down the movie titles and the current 0-10 intensities of the corresponding crescendos. Select 1 of these Specific Events for which you would like to Borrow Benefits. Play a Borrowing Benefits video. Once you master this process, you can do it with any of the Art of Delivery Videos, even if there are no prompts. Follow the prompts given on the videos. Tap along when you see the prompt to do so. Pause when you see the prompt to Pause and Assess the 0-10 intensity of your crescendo. If the intensity is zero, then choose another Specific Event and resume with the video. If the intensity is not zero, then write down the new number and resume with the video. If new issues show up during the process, make a note of them for future Borrowing Benefits sessions. When you reach the end of your video then your session is over. Start a new session to address left over issues or new issues. Consult an EFT professional if you need help clearing up any details. When the original 5 Specific Events have been collapsed, repeat the process with 5 more. You can use and re-use the Borrowing Benefits videos thousands of times. These videos are Universally Useful in that each of them is capable of addressing thousands of therapeutic issues. It is an error to conclude that only those videos with subjects that match yours will be useful. To the contrary, these videos have been purposely designed to approach issues from numerous angles. This allows your highly intelligent subconscious system to draw many parallels to your own circumstances. These videos are re-useable. You can use them repeatedly for as many Specific Events as you like. You must approach these video sessions with a relaxed attitude. The process will be unfamiliar to you at first and you will likely have initial difficulty keeping up with the tapping pace. That is to be expected. Just do your best and resist the temptation to be concerned over “doing it right.” The tapping procedure is a forgiving process and, if you miss a point or two in one round of tapping, it will be picked up again as the video progresses. Enjoy the videos. They are very engaging. After awhile, the pace will seem easy. Once you have established the Specific Event for which you are Borrowing Benefits, forget about it until it is time to pause and assess the intensity of your crescendo. Do NOT try to focus on your Specific Event during the videos. That is just getting yourself in the way and may serve to thwart the process. You may be shifting from one aspect to another without realizing it. In this case, you have likely reduced or collapsed the original aspect and are now on to another one. Thus, when assessing your intensity, make sure you are still on the same aspect. You may be shifting from one emotion to another within the same crescendo. For example, you may have started with anger and then shifted to sadness. This means the anger has been reduced and now the sadness is a new aspect to be dealt with separately (as though it was a new crescendo). Your current Specific Event may be reflecting off of another, more foundational event further back in the past. If so, Borrow Benefits on the more distant event. If you cannot locate the past event then put this item aside temporarily and go on to others. Chances are, it will collapse as a result of other issues collapsing. Also, as you Borrow Benefits, you are likely to uncover other bothersome memories. If you are unable to remember Specific Events then make one up. This may seem like a fiction but the made up event still comes from you. Sometimes this is more useful than an actual event.